DDI 3.2 was published on March 12, 2014. This version of the DDI Lifecycle specification builds on DDI Lifecycle 3.1, correcting documented bugs and refining some aspects of the specification. A change document in the download package identifies all changes, including which changes were backward compatible and the steps to take to move DDI 3.1 instances to DDI 3.2. NOTICE 2014-05-15: The DDI 3.2 schema package was reissued on 2014-05-15 to correct an error in the HTML version of the Field Level Documentation which resulted in a small number of broken links. No change has been made to the contents of the schemas themselves. The XML Schema files of DDI 3.2 are available for online usage. DDI 3.2 XML Schema is free software: you can redistribute it and/or modify it under the terms of the GNU Lesser General Public License as published by the Free Software Foundation, either version 3 of the License, or (at your option) any later version. DDI 3.2 XML Schema is distributed in the hope that it will be useful, but WITHOUT ANY WARRANTY; without even the implied warranty of MERCHANTABILITY or FITNESS FOR A PARTICULAR PURPOSE. See the GNU Lesser General Public License for more details. 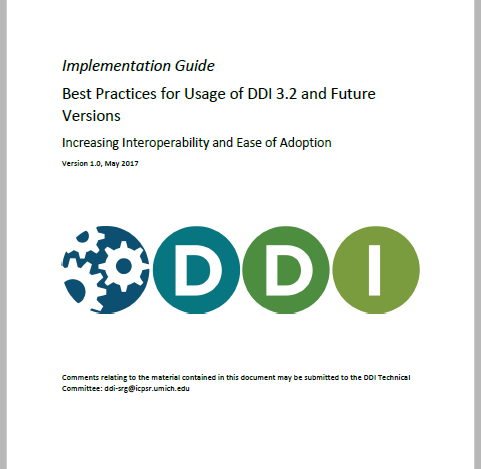 The development of DDI 3.2 draws on earlier DDI versions and work of the committees and individuals who developed them as well as the collective ideas, needs, and work of the Expert Committee of the DDI Alliance. Major contributions to DDI 3.2 were made by many individuals and organizations. The specification file contains a change document which lists all changes, whether they are backward compatible, and the changes required to move from 3.1 to 3.2.